When we visualise the nation’s ‘iconic’ landscapes, wild open national parks like the Lake and Peak Districts spring immediately to mind. But the South East and East of England are also blessed with designated landscapes including the New Forest, South Downs and Norfolk Broads, plus Areas of Outstanding Natural Beauty (AONB) like the Cotswolds and our very own Surrey Hills. Together these landscapes cover in excess of 10,000km2! They are unique, cherished and valuable natural assets, and they are facing huge challenges: climate change, increased urbanisation and growing demand for the services they provide, particularly the opportunity for recreation. Nearly 70 years after National Parks and AONBs were first established, an independent panel will undertake a new review of how these iconic landscapes meet our needs in the 21st century, and examine whether they are fit for the future. 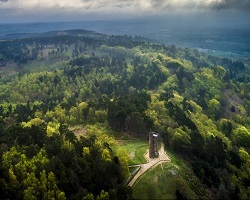 In response to the Government review, the Surrey Hills is joining the debate! A Surrey Hills Symposium hosted by the University of Surrey and sponsored by Wates will take place on Wednesday 28 November. This FREE event is an opportunity to celebrate the Surrey Hills AONB during its 60th anniversary, and to look towards the future. A ‘Question Time’ style debate will be chaired by BBC broadcaster Tom Heap of Countryfile, Costing the Earth and Panorama and a panel of experts will debate topics from climate change, future land management, tourism and business development to development pressure and London expansion. Panel members include; Merrick Denton-Thompson OBE, National Landscape Advocate and Immediate Past President of the Landscape Institute, Daniel Raven-Ellison, Campaigner and Founder, The London National Park City, Hugh Broom, Farmer and Surrey NFU, Professor Tim Jackson, Director of the Centre for the Understanding of Sustainable Prosperity, University of Surrey, Professor Caroline Scarles, Head of Tourism and Hospitality School, University of Surrey and Sarah Jane Chimbwandira, Director of Biodiversity, Evidence and Policy, Surrey Wildlife Trust and Surrey Nature Partnership. For a detailed list of speakers click here.